The Wild Weasel logo. 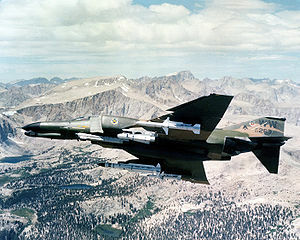 Note the "YGBSM" means "You've got to be shitting me"
An F-4G carrying weapons, from nearest to farthest, AGM-88 HARM, AGM-65 Maverick, ALQ-119 ECM pod, AGM-78 Standard ARM and AGM-45 Shrike, circa 1981. A Wild Weasel is a nickname for an aircraft in the United States Air Force that is supposed to destroy enemy anti-aircraft guns, surface-to-air missiles, and other ground attack weapons by seeking them out with radar and destroying them with missiles. The idea was first thought of in 1965 during the Vietnam War, because North Vietnamese surface-to-air missiles, or "SAMs" were destroying American aircraft. The first Wild Weasel airplane was the F-100 Super Sabre, a variant of the F-86 Sabre. In 1966, the F-105 Thunderchief took the job. After that, a new kind of F-4 Phantom IIs, the "G" model was used as a Wild Weasel. During the Gulf War of 1991, Wild Weasel missions were done by the F4-G  and not theF-16 Fighting Falcon, a light fighter-bomber that can also battle enemy fighter aircraft. Currently, the F-16CJ does this. They were being used in the Iraq War. In the Vietnam War, the main missile used by Wild Weasels was the AGM-45 Shrike. Currently, some of the weapons used by the Wild Weasel planes includes the AGM-88 HARM and the AGM-65 Maverick air-to-ground missiles. They can also have ALQ-131 and ALQ-184 pods that can mess up enemy radar. ↑ "Military History Online - The Wild Weasels in Vietnam". www.militaryhistoryonline.com. ↑ Military, Kennedy Hickman; curator, naval history expert Kennedy Hickman has nearly 20 years of experience as a museum; director; Channel, has been featured on The History. "Vietnam War: F-4 Phantom II". ThoughtCo. ↑ "Society of Wild Weasels - Home". wildweasels.org.